who: DH and I and his sister and her husband who are also DVC owners (but have never been to the HHI DVC, or to HHI). Quickie trip. Had points expiring on June 1 that I had to use. Initially booked a 1BR for just DH and I but then invited in laws and so I upped it to a 2BR. Glad because then we won't have connecting door to strangers and be in main building (all lockoffs, and elevator access, are in #11 and #12 all other buildings are dedicated 2BR and GV). Out of 6 trips there, we have had main building half the time (studios twice and 1BR once). And the 2 times we had a studio, it was exact same studio. Nice to try out another building (hopefully it will be other than what we've already been in). I made no location request so we shall see what we get. I will post the map (we have been in # 11, 12, 12- I call 12 the main building as it sort of is as they connect, 13, 18 and 25). Last edited by Lamima; 01-16-2019 at 09:47 PM. HHI is my go to resort for expiring points as well. 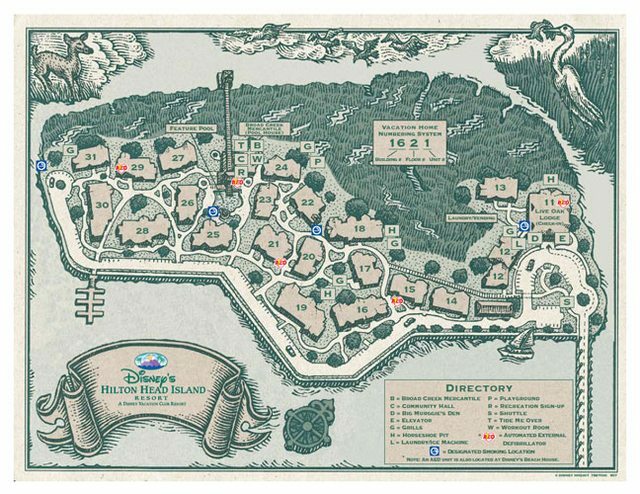 It's not too far of a drive, and is such a wonderful resort. Following along and wishing you a great trip! We go to HHI every chance we get. The resort is very well run and there is lots to do on the island. January is a great time to go because of availability and cheap points. Have a great time. Thanks everyone. Should be a nice and chill vacay. We love the HHI and staff there too...they are the best CMs DVC has. DH does want to drive around to look at various neighborhoods as we'd like to buy something there once we're done paying college tuition (1.5 years). That's all we have planned...and eating out all 3 nights but don't know where yet. Want to try new places. In laws are driving down here, from MD, today. Then they will drive me to HHI tomorrow...maybe leave around 9am. DH has to work a full day and will drive there after and get in late-ish. Works out well as in laws would like to drive straight back to MD on Monday. We tried to talk MIL and FIL into joining us. We do have a 2BR and can sleep us all. And they haven't been away since MIL was diagnosed with cancer about 15 months ago. She and FIL have been holed up as she underwent chemo and then had the mother of all surgeries and recovered from that. It was a hard road and now she is in the clear, so far all scans have showed. So they are starting to itch to get away. We all tried to get them to come. But they won't. They are joining us for F&W in October. Excellent news about your mother-in-law. Continued best wishes. We left home around 10:30 and arrived, without incident, at 4pm. So i always think it takes 4-4.5 hours but it takes 5.5. Kinda a bit long. We check in and get room 2221 in building 22. Top floor like I requested. Very familiar with the stomping above us if we got a lower floor. Showed in laws the pool area, which we are close to. Then we drove over to beach and checked it out. The beach house is closed for refurbishment. We parked and walked right out to beach. Then we went over to Kroger and got a few things to have some appetizers and drinkson our balcony while we waited for my DH to arrive. He got in at 9:30 and we headed over to Poseidon. Had a very good dinner and then went back and hit the hay. Slept until 8am. In laws are loving the area and resort. It was not what they expected. SIL is curios how much it is to book CRO. She doesnt want to use her points to book. Oh, and Pluto was here when we arrived. I have never been but really want to go.